Central Publicity Affairs Secretary of Bangladesh Jamaat-e-Islami, Professor Md. Tasnim Alam has issued the following statement on 19 January 2019 protesting and gainsaying the false and concocted information published in a report of Daily Jugantor titled “জামায়াতের কৃষিবিদের স্বীকারোক্তি” (Confession of the Jamaat backed agriculturist) which intentionally implicated Jamaat’s Secretary General Dr. Shafiqur Rahman. “Whatever is said in the report of Daily Jugantor implicating Jamaat-e-Islami and its Secretary General Dr. Shafiqur Rahman is baseless. I am condemning the report vehemently. The aforesaid report referred a so-called agriculturist Mostak Ahmed Khan who had reportedly made a confessional statement under 164 section of the criminal code while he was under police custody on last 12 January. The information which he reportedly disclosed about Jamaat-e-Islami and its Secretary General is completely baseless. Everybody knows that it is absolutely illegal and unethical to make such a confessional statement public. Police cannot conduct such an unlawful task. The Daily Jugantor also committed an offence by publishing the confessional statement. The reporter of the Daily Jugantor has no scope to know the content. Hence, it has been proved that the report of Daily Jugantor is far away from truth. It should be mentioned further that Dr. Shafiqur Rahman had never met this Mostak Ahmed Khan. So, whatever is claimed with his reference is ridiculous indeed. I want to assert that this particular report has mentioned about some NGOs which are being operated as per their own constitution and strategies. So, no question can be raised regarding the secret connection between these organizations and Jamaat’s Secretary General. Similarly, it is also hilarious if any body said that Jamaat is being financed by these organizations to launch militancy or anarchic activities. It should be added here that, the Daily Jugantor earlier published another report on 9 November. We sent our rejoinder protesting the report on that very day. But Daily Jugantor has failed to publish that rejoinder. Their inability also proved that their report was untrue. 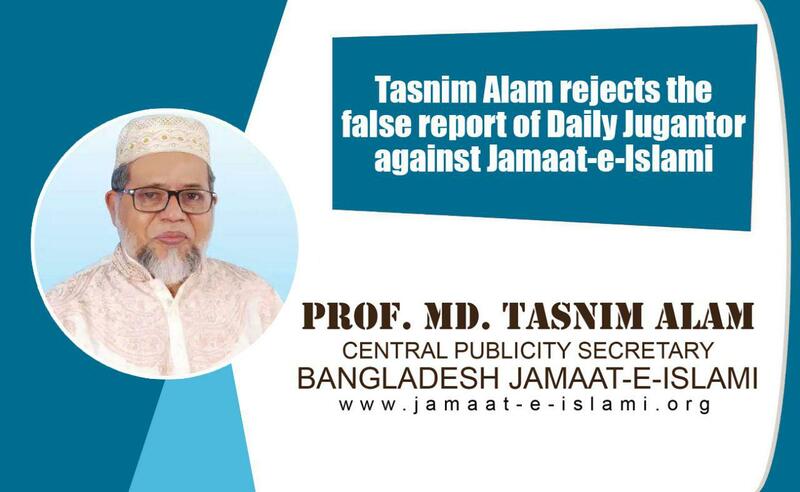 They have published another false report today just to smear the image of Jamaat-e-Islami and its Secretary General. But the countrymen would not be misguided by such false report. Therefore, I am urging the authority of Daily Jugantor to be refrained from publishing false report against Jamaat-e-Islami and its Secretary General.